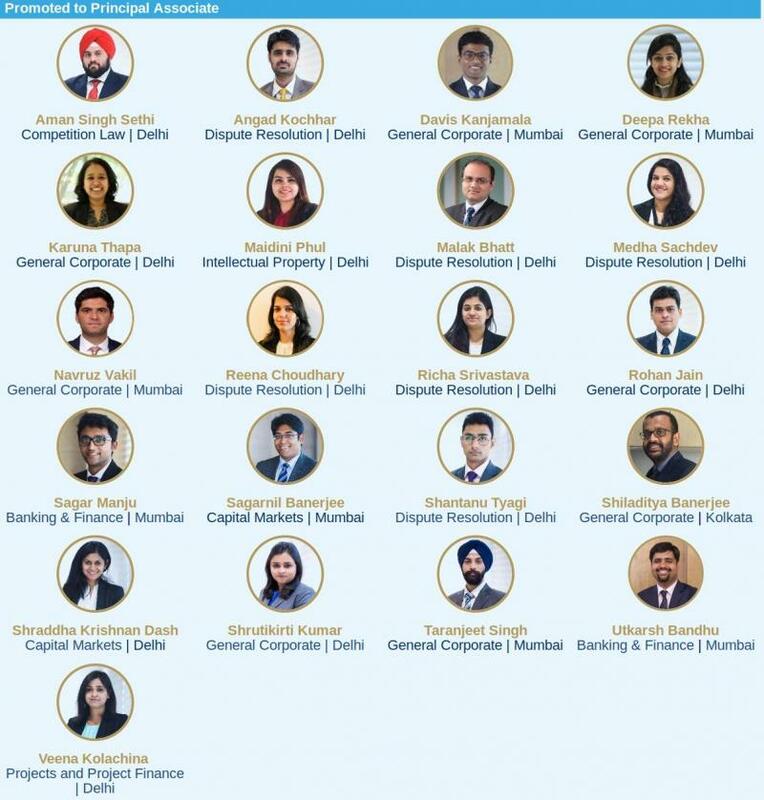 Shardul Amarchand Mangaldas has promoted 21 of its lawyers to principal associate level, as well as four new principal associate designates, and 36 of its lawyers to senior associate level. Out of the total of 61 promotions across various ranks, Delhi saw 33 promotions, closely followed by Mumbai. 13 in Delhi, 7 in Mumbai, one in Kolkata. Two each were promoted in capital markets and banking. Competition, projects and IP each saw one new PA.
Amongst the principal associates designate, Delhi saw 3, Mumbai 1. 17 of them are based in Delhi, 14 in Mumbai, 1 each in Kolkata, Chennai, Bangalore and Gurgaon. Disputes again, unsurprisingly, was heavily weighted in favour of Delhi, making up 7 of the total, though Mumbai promoted two there. What's the average compensation at each of these level in Tier 1 law firms. I am also getting an in house position with a reputed MNC where the pay is slightly less but they are way more transparent when it comes to future trajectory of my career. Also, having interned there the office environment is a lot more methodical and stress-free. I am willing to take the pay cut unless working in a firm pays exorbitant dividends in the long run. Recently tier one firms like AZB and Trilegal have elevated people with 8-9 years of work experience as partner. Usually 10-12 years is the norm if you are good enough. Fresher salary in most tier one firms is around 16-18 lakhs with bonus now. Salaried partners should get at least 1.2-1.3 crores. Bonus components would vary a lot of course. What are CAM partners making ? The partner compensation packages you quote don’t sound correct at all. I believe that a lot of them - from tier 1 firms - make no more than 70L-1Cr Per Annum. Those making more are the exception. Absolutely right. Retained partners across the board make 55-75 lakhs in smaller teams, 70-90 in the top teams. 1.5 crore RPs exist but very far and few in between. You are referring to the base payment. I included bonus in my estimate. Base payment scale of PAs and salaried partners in tier ones do not often vary much. It's the bonus that makes the difference. What are you saying dude! Its at best 70-90 for salaried partners including bonus. The bonus is a variable, in most cases performance and / or business dependant, component in pay. You would’ve had a point if every tier 1 firm gave over 35%-40% of annual pay as bonus, on a minimum. This, my dear, isn’t so, in almost all cases - including the “boutique firms”; speaking of the ones that are known to pay hefty bonuses. I am glad that you’re anonymous - god forbid if any client/ prospect were to get wind of your proven ability in Mathematics ! Even I want to know the rough estimate of how much compensation is offered among the Big 6 ?! It appears that no one wants to answer your question directly, so is my advice: opt for the law firm. Career progression is faster in a law firm, or at least in the bigger and/or more successful places. Increase in remuneration would also be faster in a firm. My suggestion even otherwise would be to start with the law firm. Soul-crushing slogging and unending drudgery is something one must experience and put behind in the junior years. It would also make your basic concepts strong and give you a good understanding of many aspects of the practise of law. You have not mentioned the area of work that either of your options offer. Nonetheless, unless the MNC is offerring you something different or exciting, or will help you relocate abroad, etc., go for the law firm. It is much easier to move from a firm to an in-house role than the other way (which does happen, but is less common). Thank you so much. My firm profile would be general corporate but the MNC is a combination of many things. I am still tilted towards the MNC because I have worked both at the MNC and the firm and let's just say it's not the most ideal working environment at this firm but maybe it's just my internal rationalization to avoid those long dreaded hours I had to pull in as an intern. Well, go for it, then. Sounds like the MNC offer is the better one in your eyes. At the end of the day, you should have the satisfaction of having done what you wanted to do. But don't expect a comfy, 9-to-5 sort of a job. Most MNCs have under-staffed legal teams and expect a great deal of productivity out of them. You will be expected to slog, but, yes, late nights will be few and weekends and holidays will be respected. Karuna, Aakanksha and Anish - bhokaal!!! What about Partner Promotions? Does SAM announce them later? Atika vaz - congratulations! Very well deserved! Mera aashirwaad sabke saath hai !! Arrey kuch demotions bhi zaruri hain. Sabse pehle poore HR ko fire karo SAM ke. arre bhai woh gurgaon mein job dundh rahe hai! Each of these lawyers represent SAM’s commitment to quality and excellence. There will always be haters and some mistakes made along the way to greatness, and SAM’s success proves this beyond doubt. Kya ho gaya bhai! Mujhe to koi hate comment ya hater nai dikh ra hai. Tumhara mood kyu itta kharab hai? Seems like they got to you bro. Was this vetted by SAM before you posted it here, or is the other way round ;) ? This is barely newsworthy. Can understand partner level promotions or moves, but seriously this?! Jokes aside, though, I think it sheds a useful light on the internal pipeline and also strategy, regarding offices and practice areas... Plus, it's nice for associates to also get some love on LI, rather than just partners all the time. Akansha - Not just an amazing lawyer but also a gem of a person. I know for fact [...] is a rockstar in [...] law, and even otherwise (from what I hear from his colleagues). I always thought he was a [...]. Why is he now becoming a [...]? In fact, why isn't he partner by now? Initials wagera use kar lia hota! Practice area bhi nai mention kia? Website chal gai to dosto ko bhul jaoge? Yahi pyar, yahi dosti? Anyways (abt the guy I inteded to refer) - Londa stud hai. Thats all. Heh heh. Actually, the real story is [censored]. So, which is why [censored] [censored]. But that's okay. Happens in life. A year or two here and there are fine, you know. So, so, so well deserved. So proud of you. 1. Offered a callback. We "guarantee" it says Partner. 2. Partner then says no vacancy. 3. No internship certificate till date, after nearly 6 months. Three promotions in a small IP team. Seems they are doing really well. More gems than De Beers it seems, not enough lawyers though!